Unless we defend the religious liberty of everyone, it will not long exist for anyone. I write to object to anti-religious programming produced and aired under your auspices. The Aftermath program aired on A&E is an outrageous attack on the Church of Scientology and, by inference, other new religious expressions which are less known by the public at large. This is precisely the same method of incubation for the rampant racism in our society—false claims about a class of people are too often accepted uncritically as fact by those without personal experience with members of the demonized class. As a United Methodist minister, I have been Executive Director of the Queens Federation of Churches for the past 41 years. The Queens Federation is an ecumenical council of Christian congregations in the Borough of Queens, City of New York. 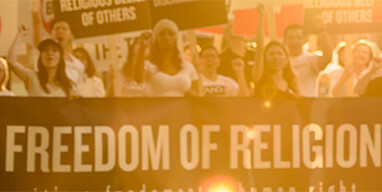 For most of those years, I have been a member of the national Committee on Religious Liberty, originally organized by the National Council of Churches and now under the auspices of the Religious Freedom Project of the Newseum Institute. I have served as moderator of this Committee since 2000, which meets regularly in Washington and brings together score of attorneys and advocates from many diverse religious and secular organizations concerned to protect religious liberty. Protecting the right of persons to practice the faith of one’s choice—and to organize together for that purpose—is a basic human right supported not only by the First Amendment to the U.S. Constitution, but by the Universal Declaration of Human Rights. It is incumbent on all of us to work to protect this basic right and to combat every form of religious intolerance which, ultimately, works to incite violence against individuals and religious organizations. Recent news headlines confirm the violence borne of extreme bias and hatred. Many acts have been committed against Scientology churches, threatening individual Scientologists. These have been incited by Leah Remini and her TV show, and by others who also seek to demonize new religious movements. Having watched some of the series episodes, it is clear to me that an assembly of disgruntled persons expelled by the Church for misconduct appear to certify each other’s falsehoods to an otherwise ignorant audience. I cannot understand why Disney provides support for the Leah Remini series on A&E. Surely there are more prudential ways of generating revenue than instigating religious bias and bigotry. Please substitute more wholesome programming for this dangerous hate-baiting series. Rev. N. J L’Heureux Jr.